Charles Bernard Nordhoff (born London, 1887) and James Norman Hall (born Iowa, 1887) were both published authors when they first met at the end of World War I. Both men had distinguished themselves as flyers in the famed Lafayette Escadrille Corps, and while serving in the squadron, each of them wrote articles for the Atlantic Monthly about their wartime experiences. When the war ended, their first literary collaboration, The Lafayette Flying Corps, was published in 1920 and so began a long and successful writing career for them both. They were given a commission by Harper’s Magazine to write travel articles set in the South Pacific, so travelled to Tahiti for research and inspiration and ended up calling Tahiti home. Their first collaboration about the South Seas, Faery Lands, sold quite well but the collaboration deteriorated and the two men began writing on their own again. Hall departed for Iceland, while Nordhoff concentrated his efforts on writing books for boys. In the span of four years he published three adventure books, married a Tahitian woman, and fathered several children. Strong drink and growing depression, however, caused Nordhoff to begin to question his ability as a writer. 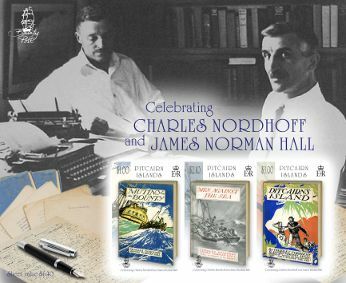 Hall, meanwhile, struggled with travel books, finally deciding to return to Tahiti and teamed up with Nordhoff again to collaborate on what was to become a series of best sellers. With Hall tempering Nordhoff's uncontrollable energy and Nordhoff inspiring Hall's imagination they published, on their special double typewriter, Falcons of France: A Tale of Youth and the Air (1929), The Hurricane (1936), Dark River (1938), No More Gas (1940), Botany Bay (1941), Men Without Country (1942), and The High Barbaree (1945). The pinnacle of their success, however, was the Bounty Trilogy: Mutiny on the Bounty (1932); Men Against the Sea (1934), which recounts Bligh's open-boat voyage, and Pitcairn's Island (1934), which tells about Fletcher Christian finding and inhabiting Pitcairn Island. They gained critical acclaim for their trilogy but after their success, Nordhoff became disillusioned with writing, yet he continued to collaborate with Hall, turning out several more popular novels. In 1936 he divorced his first wife, left Tahiti a few years later and returned to California where, in 1941, he married Laura Grainger Whiley. During WWII he had the honour of having a Liberty ship, SS Charles Nordhoff, named after him. Nordhoff, however, always wanted to return to Tahiti but he went instead to live at his parents' home and during a bout of depression, died there on April 11, 1947, a broken man yearning for his paradise home. Hall returned to his hometown in Iowa and there he worked on more successful novels and short essays. In 1951, knowing that he was dying, Hall and his wife returned to Tahiti where his condition deteriorated quickly. He died on July 6 and was buried with full Tahitian funeral rites. 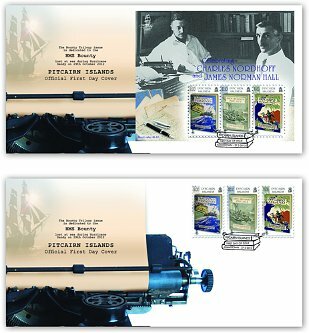 The Pitcairn Islands Philatelic Bureau commemorates the work of Charles Nordhoff and James Hall and recognises the contribution of the Bounty Trilogy in raising Pitcairn’s profile internationally. Acknowledgement: Jacket images supplied by the Burling Library Archives, Grinnell, USA Writers’ image supplied by the Maison James Norman Hall, Tahiti.